For all I write about clothing, I've been sort of flailing around myself lately without a good sense of my own style. I did a bit of a jump from polo and jeans to smart business casual a while ago, and I think I jumped too far, because while I was still looking presentable I didn't really look like me, if that makes any sense. What this left me with was no idea what to shop for. I felt I was overdressing a bit for work because it's really a t-shirt-and-jeans department, except for upper management who dress quite conservatively business-casual. I'm not very conservative. So I found myself trying to find some sort of anchor, and I found it in a couple pairs of jeans. The problem, as I see it, was that people here dress very casually, but without a whole lot of care: pleated Dockers and a poorly-fitted polo or button-down, that sort of thing. It doesn't send an "I care" message, and that's the message I do want to send. The first time I tried to fix this I did it by buying inoffensive but nice business-casual: brushed-cotton chinos, dress shirts, that sort of thing. But that felt out of place around my jeansy coworkers and it felt like I wasn't wearing something that I'd usually wear. But I picked up a couple of pairs of jeans lately, dark and raw denim, slim straight fit (at Bluenotes, of all places -- for $30 and $10), and while trying them on with some shirts in my closet I had an "Aha!" moment: If I dress up chinos-and-a-shirt I don't feel like I fit in with my coworkers, but if I dress up jeans and a shirt then I'm getting somewhere. This sort of look, without the tie, and not as.. posed. So with that in mind and the abovementioned $10 jeans on, I went out shopping last night, picked up a couple more shirts from America (for $20 and $30, regular $70), and a peacoat from Club Monaco ($100 off), and it was the easiest and most fun shopping trip I've had in ages, which makes me think I'm on the right track. So yay! 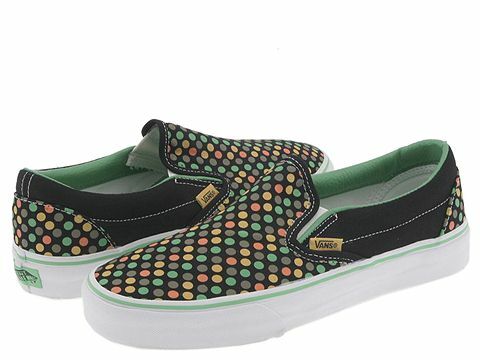 But I need new shoes and I'm having a hard time deciding what I want. I want brown boots or shoes to wear with slim jeans, stacked or cuffed. I'm partial to #3 myself. What do you guys think? You don't live far enough west to excuse brown shoes at all. West? 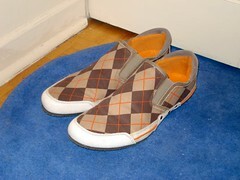 These, for instance, are not the shoes of west. Brown just lets shoes be interesting. I like 2, 3, and 5. Already have a pair! Otherwise this would be easy. Then I'm not sure why you are looking anywhere else? The ones I have are black! (With blue elastic panels, no less.) As much as I love them, I don't want two pairs of the same boots but in different colors. I considered a pair of R.M.Williams jodhpurs, but they're too expensive for me right now. Have you thought about going a bit more classy? Ankle cowboy boots? With elastic panels? They're Chelseas! For what it's worth, I think I like the Ben Sherman's best. I love them! I'm just not sure I love them with my jeans. They're pretty pointy and the sole's pretty thin. The two Bronx ones almost have commando soles and a toe box like parade boots. See? I'm just not sure it's the right scale for jeans. Since I'm clearly the one who sticks to the fashion trends when it comes to footwear (see handle and/or avatar), my vote would be (in order of preference) 2, 4 or 1. Not really into the bootsy thing. Desert boots are coming back this year for sure. Picked up a pair of brown leatehr ones similar to your number 2 at Roots this month. Yeah, lots of companies copy Clarks, or base designs on them at least -- but that's mostly just because Clarks has been around for a very long time, and a lot of their styles are decades old. It's sort of the same way that a lot of dress shoe companies happen to have wingtips and captoes.